At Mr. Rescue Plumbing & Drain Cleaning our motto is to be Fast, professional, reliable and highly expert when it comes to Plumbing and Drain Cleaning, we always put our customers first and strive to impress first time and every time by providing a world class customer service 24 hours a day 7 days a week. Our emergency plumbers are available to deal with any problems, including the most stubborn of blocked drains. If you have a blocked pipe or toilet, busted pipe, leaky tap, overflowing drain or blocked drain Mr. 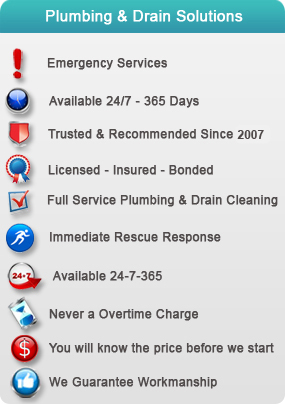 Rescue Plumbing & Drain Cleaning is here to help you 24 hours a day, no matter what emergency you have. Need a 24 hour emergency plumber? Mr. Rescue Plumbing & Drain Cleaning is here. We provide experts who can solve your plumbing and drainage problems without delay. Mr. 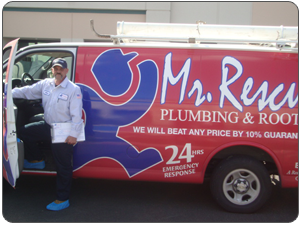 Rescue Plumbing & Drain Cleaning performs a wide selection of repairs for customers. These includes pipe repairs, drainage sterilization, clearing clogged pipes and drains, drain cleaning, unblocking toilets, baths, and sinks, and much more. Our experts are always available to diagnose and solve your plumbing and drain problems. Our goal is to provide a top quality service and a fast resolution for all customers. Mr. Rescue Plumbing & Drain Cleaning & Drain Cleaning offer competitive rates for both residential and commercial plumbing, clearing drains, tank or tankless water heaters, slab leak repair and detection and other emergency services at no hidden fees or charges. There is never a over time charge on nights and weekends and you will know the price before and work is started. Save time save money call Mr. Rescue Plumbing & Drain Cleaning today. 24/7 emergency service, residential and commercial, drain clogs and sewer line cleaning with free estimates, video sewer inspections, trenchless sewer replacement or excavation, sewer ejectors, drain repair, drain replace, sewer repair, sewer replace, clogged drain, clogged sewer, clogged toilet, grease traps, septic tank pumping, septic tank inspection, leach lines, storm drains, storm drain service, storm drain maintainence, floor drains. 24/7 emergency service, bath/ kitchen fixtures and faucets repaired and replaced, water heater repair and replacement, toilets, sinks, tubs, outside faucets, gate valves, shutoff valves. 24/7 emergency service, water heater repair and replacement, gas lines, water lines, anode rod replacement, water heater maintenance, water treatment systems, tank water heaters, tankless water heaters, water softener, on demand water heater, natural gas water heaters, electric water heaters, Ask us about tax credits on high-efficiency tankless water heaters. 24/7 emergency service, trenchless sewer replacement, trenchless sewer repair, trenchless water lines repair, trenchless water lines replacement, trenchless gas line repair, trenchless gas line replacement, pipe bursting. 24/7 emergency service, leak detection, water leak detection, water leak repair, gas leak detection, gas leak repair, sewer leak detection, sewer leak repair, line location, utility location, Slab leaks. All phase comercial plumbing repairs, installation, repairs, Comercial drain cleaning, new construction plumbing, remodeling plumbing. Hydrojet main and secondary lines from 1500 to 4000 psi, hydrojet main lines, hydrojet secondry drain lines, hydrojet floor drains.